When members of soccer’s hierarchy were plucked from their Zurich bedrooms at dawn by police in May 2015, any vestiges of trust remaining in FIFA vanished. As the first FIFA trial concludes in New York and a former vice president is sent to jail, the governing body still hasn’t shown the corrupt culture that infected soccer has been eradicated. Officials booted out in the last year while trying to clean up the game still question the commitment of the post-Sepp Blatter FIFA, led by Gianni Infantino, to meaningfully banish the rogues. FIFA still tries to portray itself as the victim of the corruption of dozens of soccer officials. It even wants a cut of the more than $200 million being reclaimed from individuals and marketing companies. And yet, incongruously, FIFA brazenly disputes the U.S. Department of Justice’s portrayal as this being a case centered on FIFA. It is all about the tournaments or television rights in the Americas, FIFA contends, overlooking the former members of its top brass implicated in bribery and the allegations aired in court about World Cup hosting votes and television rights deals. FIFA has often given the impression of doing the bare minimum against officials implicated in wrongdoing. Willful blindness or complicity? The wave of arrests in 2015 was the result of wiretaps and stacks of evidence being gathered by criminal investigators, not proactive moves by FIFA. Before then, FIFA begrudgingly implemented ethics processes that eventually brought down Blatter. But too often FIFA sneered at campaigners advocating reforms, and acted half-heartedly against those illegally profiting from the game. Only once FIFA realized American prosecutors were at their doors did overhauling the governance of the game become a priority. Infantino was well-placed to shape the future of FIFA. Then general secretary at European body UEFA, the Swiss-Italian served on the FIFA reform committee in 2015 just as a path to the FIFA presidency opened up as favorite Michel Platini was toppled by financial wrongdoing. – Gorka Villar, the former director general of South American confederation CONMEBOL who was arrested in a Spanish corruption investigation in July. There were several meaningful reforms, such as 12-year term limits for FIFA presidents and council members, but other recommendations have fallen by the wayside. The finance committee – headed for years by Blatter’s bribe-taking right-hand man Julio Grondona – does not now, as envisaged in 2015, have a majority of independent members to protect FIFA’s cash. There has also been no recalibration of power to dilute the authority of the FIFA president. Criticism came this month in a report from the Parliamentary Assembly of the Council of Europe (PACE). Infantino’s ”micro-management” and control appears as ”strong as under the previous leadership.” Fatma Samoura, the first African secretary general, has not gained the authority envisaged. The politicians behind the PACE report were deeply skeptical over the actions of FIFA’s new leadership, while not doubting Infantino’s integrity. The lack of separation of political and administrative functions is problematic. In his first elected position, Infantino has to maintain political goodwill within the game. Tough talk from Infantino does not seem a charade. But how willing is Infantino to rock the boat of an institution where maintaining the political goodwill of the majority of the 211 FIFA nations is required to win re-election in 2019? Just look at the murkiness around the departures of key personnel, including Maduro, who were installed to enforce better working practices or banish the offenders. The inadequate explanation and communication to the media, public and – most significantly – to some members of the ruling council gave the impression Infantino was acting sneakily. Infantino cannot expect the sudden jettisoning of the ethics judge and investigator to be so accepted without question when they were in the midst of awkward probes into the leadership of the Russia World Cup and had looked into elements of the FIFA president’s own conduct. ”The general feeling is that FIFA Council and Mr. Infantino in particular wished to get rid of persons who might have embarrassed them,” former Parliamentary Assembly of the Council of Europe President Anne Brasseur wrote in her report. Infantino needs to heed the advice of the FIFA reform report he helped to author. ”It is abundantly clear that football fans and FIFA’s commercial partners will no longer accept anything short of full transparency in how football is governed,” it stated. Perhaps that is why more than 20 sponsor slots remain vacant for the 2018 World Cup – a tournament whose chief organizer remains Vitaly Mutko despite Russia’s deputy prime minster helping to sabotage the 2014 Winter Olympics through a doping program. ”Unethical behavior cannot be tolerated,” that 2015 FIFA reform report stated and yet Infantino appeared alongside Mutko in Moscow this month at the World Cup draw. Maduro, the FIFA governance committee head until May, testified to British politicians in September that he was told action against Mutko would be a ”disaster” for the 2018 World Cup and Infantino’s presidency could be jeopardized. Infantino disputed the claims. He needs a successful World Cup to show FIFA is back on track but that cannot be at the expense of taking action where necessary. Will Infantino order an investigation into the fresh bribery allegations around Qatar’s 2022 World Cup bid? The Gulf nation has been previously cleared to remain host but the untested claims from the New York court leave a fresh cloud over the bid’s conduct. Will Infantino order a deep examination of World Cup broadcast contrasts after claims bribes were paid by officials with networks across the Americas? This is Infantino’s chance to show how committed he really is to overhauling the bloated culture of FIFA, a notional non-for-profit organization that still spends on vanity projects like the wealthiest of private entities. And the question remains whether soccer fans should now be able to trust FIFA? The organization declined to put anyone up for interview to answer it. GENEVA (AP) The verdict is in: FIFA is not going to move past a sweeping bribery investigation into international soccer so easily. A former FIFA vice president for South America and the Brazilian head of the 2014 World Cup organizing committee were found guilty of racketeering charges in a federal court in New York on Friday. Juan Angel Napout of Paraguay and Jose Maria Marin denied the kind of corruption charges that more than 20 soccer and marketing executives working across the Americas have already admitted to the U.S. Department of Justice. More have been indicted and are fighting extradition. Jurors will resume next week deliberating on racketeering charges against the third defendant, Manuel Burga, Peru’s former soccer leader who sat on a FIFA panel distributing tens of millions of dollars in project grants. Evidence in a six-week trial often did not directly touch soccer games and commercial deals run from FIFA’s home in Zurich. For more than 20 years, some soccer officials acted as if they were entitled to kickbacks from broadcasting and sponsorship deals. And they acted as if they were untouchable by sports judicial bodies, despite warning signs from criminal and civil court cases that touched FIFA in Switzerland up to a decade ago. In Brooklyn federal court a picture was painted of South American men high in the FIFA hierarchy routinely taking payments of hundreds of thousands of dollars, sometimes millions. 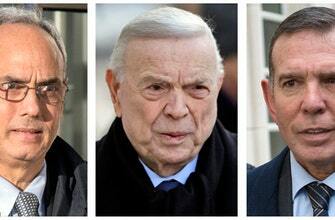 The three defendants were second-tier figures in the bigger FIFA picture. Yet each got $4.4 million to $10.5 million in bribes since 2010, prosecutors said. In the U.S. federal agencies’ wider investigation of soccer officials across the Americas, some of the more than 40 people charged allegedly were paid and took bribes dating back 25 years. Many pleaded guilty for reduced sentences. It was no secret that some South American soccer leaders were corrupt. The two men convicted Friday were relatively late arrivals on the soccer bribery scene. At times in court it seemed a previous generation who long held South America’s influence at FIFA were also on trial. Indeed, Napout and Burga were said to be in a ”Group of Six” seeking a share of power and bribes routinely taken by Julio Grondona of Argentina, Ricardo Teixeira of Brazil and Nicolas Leoz of Paraguay. Grondona was FIFA’s senior vice president – second in command to Sepp Blatter – and finance committee chairman when he died in July 2014 aged 82. He is ”co-conspirator 1” in Department of Justice indictments unsealed in 2015. Teixeira and Leoz were also indicted but have not been extradited. Both left the FIFA executive committee by April 2013 to avoid ethics committee bans for taking kickbacks from World Cup TV deals in a previous scandal known as the ISL case. As new FIFA leaders try to win public trust, its vice president from South America is another Paraguayan, Alejandro Dominguez. Yet Dominguez, the new FIFA finance chairman, was described unfavorably in court. Star prosecution witness Alejandro Burzaco said Napout told him Dominguez was ”not a very successful businessman (who) will probably request” a bribe. The tiny, wealthy 2022 World Cup host nation also had a tough trial. Qatar spent much of the past seven years denying it bought victory or acted improperly toward FIFA voters. Still, testimony in Brooklyn suggested a broader plan to build influence among voters’ colleagues, even if the defendants had no vote when FIFA’s executive committee picked the 2018-2022 World Cup hosts in December 2010. However, Grondona, Teixeira and Leoz did have votes. South America’s trio ultimately supported Qatar in a five-nation 2022 contest, beating the U.S. in the final round. In court, star witness Burzaco – an Argentine marketing executive who paid bribes and made a deal with prosecutors to testify – described his associate Grondona complaining to Qataris at a five-star hotel in Rio de Janeiro about selling his vote too cheaply. Grondona said he got into ”all these mess and scandal for only” $1.5 million, while Teixeira got tens of millions,” Burzaco said. At a Madrid hotel before the 2010 Champions League final, South American soccer officials were told that $15 million from Qatari interests was available as bribes money, according to one witness who has pleaded guilty, Luis Bedoya of Colombia. Nothing said in court appears to directly threaten World Cup hosting for Qatar, which remains under blockade by its regional neighbors. Still, it fueled the idea that Qatar’s path toward its greatest sporting moment will never be smooth. FIFA has paid tens of millions of dollars to American lawyers and media consultants to help persuade the Department of Justice it is a victim of corruption, and not complicit. That investment seemed to pay off in court. Direct references to FIFA leaders and staffers were rarely heard. That should help FIFA get a share of more than $200 million in forfeitures by agencies and people who have been indicted or pleaded guilty in the wider case. FIFA’s restitution claim in March 2016 was for $38.2 million plus legal fees and compensation for reputational damage. A longer-term issue for FIFA is its 2026 and 2030 World Cup broadcast partners. While not charged in the American case, Fox Sports, Globo of Brazil, Televisa of Mexico were mentioned in testimony. They allegedly teamed up to bribe Grondona with $15 million to secure two-tournament deals in South America. Another 2026-2030 rights holder, Qatar’s BeIN, is already under criminal investigation in Switzerland for suspected bribery in that deal. On June 13 in Moscow, FIFA member federations will pick the 2026 World Cup host. The North American bid – splitting 60 games in the United States, 10 in Canada, 10 in Mexico – is favored to win. It is unclear if the other bidder, Morocco, can even stage an expanded 48-team tournament. But will voters reward the nation whose law enforcement agencies shook FIFA to its core? They might be persuaded by money. 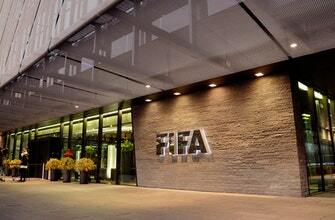 FIFA relies on World Cup commercial deals for about 85 percent of its income. It likely will need a bankable World Cup after under-performing sponsorship programs for the next two editions in Russia and Qatar. A North American World Cup should set records for average game attendance and profitability. It could also woo potential sponsors currently wary of working with a FIFA that risked being indicted. Brooklyn; Bern, Switzerland; Paris; Rio de Janeiro. In all four cities federal prosecutors are pursuing allegations of corruption in global sports, including winning bids for the 2006, 2010, 2018 and 2022 World Cups, plus the 2016 and 2020 Olympics. Suspects so far include Germany soccer great Franz Beckenbauer, 2016 Rio Olympics organizer Carlos Nuzman, and one-time International Olympic Committee rising star Frank Fredericks. A protected witness in the U.S. is Russian doping whistleblower Grigory Rodchenkov, former director of the Moscow testing laboratory. In Brooklyn, a spin-off case saw a former FIFA audit committee member from Guam plead guilty to taking bribes from an Olympic Council of Asia account. The clearly identified ”co-conspirator 2” in that case is a kingpin of Olympic politics, Sheikh Ahmad Al-Fahad Al-Sabah of Kuwait. Prosecutors in four cities, sharing information, taking years to build cases. More seem sure to follow. NASHVILLE, Tenn. (AP) Major League Soccer is expanding its presence in the southeast, awarding Nashville the first of its newest expansion franchises as MLS’ 24th team . Commissioner Don Garber made the announcement Wednesday at a news conference with Tennessee Gov. Bill Haslam, Nashville Mayor Megan Barry and John R. Ingram, head of the group that will own the team. Nashville had been vying with Cincinnati, Detroit and Sacramento, California, as the finalists for the league’s latest two expansion teams. A decision on the second winner is expected within a few weeks. Atlanta and Minnesota joined this year and Los Angeles FC starts in March, giving the league 23 teams. When Nashville starts playing remains to be decided. Garber said it was unlikely the team would debut in 2019 but 2020 was a possibility. Nashville Soccer Holdings LLC includes Ingram, chairman of Ingram Industries Inc.; and the Wilf family, owner of the NFL’s Minnesota Vikings. Ingram said it was a landmark day both for Nashville and the area’s soccer fans who made a strong case for why the league needs to be in Music City. The Metro Nashville City Council on Nov. 7 approved $225 million in revenue bonds to construct a 27,500-seat soccer stadium and an additional $50 million in bonds for renovations and improvements around the site at the current fairgrounds. The stadium could open by March 2021, with the bonds only waiting for Nashville to receive an expansion franchise. Garber said it will be up to Ingram and the Nashville owners whether the new team gets a new name or keeps the Nashville SC identify used for the team starting in the second-tier United Soccer League next season. 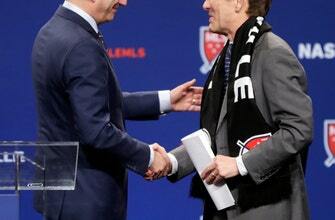 Garber said Sacramento, seen as the other favorite, is MLS ready. MLS joins the NFL in Nashville with the Tennessee Titans and the NHL with the Nashville Predators. Forward Filip Forsberg of the Predators was at the news conference Wednesday, and the Titans tweeted out photos of players holding up shirts supporting the town’s newest pro team. – All I’ve got to say about last night was, they’re alive. They’re still alive. I don’t know how? But they’re alive. I told you it took seven years off my life. Ernestine is not speaking to me. Our Maltese, Hazel, is definitely not speaking to me. They said the neighbors complained about me because I was losing my mind over all of the above. And just for the record, to put this in the scope of this quote unquote game, which was an eyesore of a football game between what looked like two bad team, to be honest about this, that’s what it looked like to me, the Cowboys should have put this game away in the first quarter and shut up all those black hole fans. Should have just done it. Because the Raiders were asking to be beaten in the first quarter. And they let them off the hook. – 11. Fourth and 11 for you– you ran a fake punt, and the punter had to cut inside the block. So it wasn’t like there’s just an open flank. And Chris Jones, who could run a little bit, ran 24 yards. And all of a sudden, they have to resort to some sort of statue of liberty, what was it, a throwback play. But that didn’t work. And they go down and get the touchdown. So it’s 17 to 10. And then this thing happens. Fourth and one. – Flee flicker. The flee flicker. – Flea flicker. It was a flea flicker. So it’s fourth and one from the Cowboy 39. This is the whole season for them. This is game on the line. Because if you don’t get the 1 yard, it’s going to be dubious that you’re going to win and survive this game. Because the Raiders have all the momentum. And you’ve got none. The line cannot protect Dak Prescott in the second half. They can’t get an inch running the football. And now it’s going to come down to a centimeter thanks to Gene Steratore. Now I agree with Dak Prescott, I thought on a second thrust, I thought he more than got the first down on the second thrust. But it was so busy inside the scrum, you couldn’t really see. But I thought he thrusted again with the football before he went down. I thought he got a bad spot. But the spot was the spot. And I think Gene Steratore got mixed up. I do. I think he got it backwards in his head. – So you think he said no first down. – Yeah, he just got– remember, he’s a showman to a fault. I don’t like referees who are showman. Remember, Joey Crawford in the NBA. He’s such a showman. He’s trying to, he wants to be the story. And, finally, he’s going off on the Spurs’ bench calling technicals. And they suspended him for a while. But the point is Steratore is grinning. And he’s having a good time, he’s cutting up with everybody. So he’s going to be a showman. He’s going to pull out some kind of no card that’s doubled up, you know it’s folded over. And he’s going to show you, and all of a sudden, he shows you it’s not a first down. But it’s not. It was so clearly not. I said it’s a centimeter. , But it was like a quarter of an inch short. Right? – Yes. Yes, it was. – It was clearly not a first down. And I took one look at it before the no card went down, and I said that’s. – I said the same thing. – I just sat back, and said, we’re done. Season’s over. Game over. They’re going to go score, and this is going to go crazy the other way. SAN FRANCISCO (AP) — Texas acquired Matt Moore in a trade with the San Francisco Giants on Friday, raising the possibility of four left-handers in the Rangers’ rotation. Texas sent minor league right-handers Israel Cruz and Sam Wolff to the Giants. The Rangers also received $750,000 in international signing bonus pool allotment from the Giants. Perez, a 13-game winner, and Cole Hamels, another lefty who won 11 games, were the only holdover Texas starters when the offseason started. Counting Moore, the Rangers have added three options to their rotation. Right-hander Doug Fister agreed to a $4 million, one-year deal that could be worth up to $11.5 million over two seasons, and lefty Mark Minor received a $28 million, three-year contract. Minor was a reliever for Kansas City last season but previously was a starter for Atlanta before missing the 2015 and 2016 seasons with shoulder issues. Daniels said the club still intends to prepare Minor as a starter in spring training. “We talked about when he signed, both he and us are aware that that could change based either one the club, kind of how it’s shaping out, or if he has any issues getting stretched out,” said Daniels, who is interested in acquiring even more starting pitching. Right-hander Andrew Cashner, another 11-game winner for Texas, became a free agent after completing a $10 million, one-year deal. San Francisco last month exercised Moore’s $7 million option for 2018. He went 6-15 with a 5.52 ERA in 174 1/3 innings last season, setting a career high for losses, as the Giants finished last in the NL West. He allowed a career-worst 107 earned runs. Texas went 78-84 and finished third in the AL West behind the World Series champion Houston Astros and the Los Angeles Angels. San Francisco — last in the NL West in 2017 and having lost out in pursuits of Giancarlo Stanton and Shohei Ohtani — acquired Moore at the 2016 trade deadline from Tampa Bay for third baseman Matt Duffy. The lefty’s best season came in 2013, when he was 17-4 with the Rays. Daniels said the Rangers were interested in acquiring Moore when the Giants got him. In 2011, Moore pitched seven scoreless innings at the Rangers in his playoff debut in Game 1 of an AL Division Series, allowing just two hits in a 9-0 Tampa Bay victory. The Rangers won the next three games to take the series. In his only postseason start for the Giants, Moore had 10 strikeouts in eight innings to help San Francisco to a 5-2 lead over the Chicago Cubs in Game 4 of the 2016 NL Division Series. The Cubs rallied in the ninth for a 6-5 victory to win the series on their way to the World Series title. The 20-year-old Cruz was 3-2 with a 5.91 ERA in three starts and nine relief appearances for the Arizona League Rangers in 2017 this year. Wolff, 26, was 2-3 with a 3.54 ERA and three saves in 16 games at Double-A Frisco this year and 2-2 with a 2.38 ERA in 24 games at Triple-A Round Rock. He had surgery in August to repair a torn right flexor tendon. NEW YORK (AP) The Mets added catcher Jose Lobaton, who will try to earn a roster spot in spring training, and finalized their $14 million, two-year contract with reliever Anthony Swarzak on Friday. Lobaton will report to big league spring training and compete with Kevin Plawecki for a backup job behind Travis d’Arnaud. Lobaton would get a $1.25 million, one-year contract if added to the 40-man roster. The switch-hitting 33-year-old batted .170 with four home runs and 11 RBIs in 158 plate appearances over 51 games with Washington this year, his most since 2014. He is 5 for 18 (.278) with two homers in nine postseason games. Lobaton has a .218 career average with 21 homers and 103 RBIs in eight seasons with San Diego (2009), Tampa Bay (2011-13) and Washington (2014-17). Swarzak, a 32-year-old right-hander, gets a $1 million signing bonus payable within 30 days of the contract’s approval by the commissioner’s office and salaries of $5 million next year and $8 million in 2019. He reunites with new Mets manager Mickey Callaway. Swarzak spent the first 2+ months of the 2015 season with Cleveland, making 10 appearances with a 3.38 ERA. Callaway was hired to manage the Mets in October after five seasons as the Indians’ pitching coach. Swarzak was a combined 6-4 with two saves and a 2.33 ERA in 70 games last season for the Chicago White Sox and Milwaukee. He had 91 strikeouts in 77 1/3 innings. He has pitched for five teams in the last four years, including Minnesota, Cleveland and the Yankees. His fastball velocity increased from 93 mph in 2015 to 95 mph this year, according to Brooks Baseball. A four-pitch pitcher through 2014, he was restricted to a fastball and slider by Callaway before bringing back his changeup this year. New York finished 70-92 and went to the winter meetings this week looking for a reliever to join closer Jeurys Familia, left-hander Jerry Blevins and righty A.J. Ramos at the back end of the bullpen. Swarzak is 23-30 with a 4.22 ERA over eight seasons. He began his major league career in 2009 with the Twins and was a starter his first year, then began moving into a relief role.